Located north of the City Hall in the 500 block of S. Broadway. Later known as the South Side School. Located at the corner of Shabbona and E. 1st Streets. Later known as the North Side School. There were eight graduates: J. Paul Johnson, George F. Campbell, James S. Miller, William Harry Campbell, Victoria L. Trotter, Jeanie L. Howat, Winifred F. Housby and Mary Cerveny. 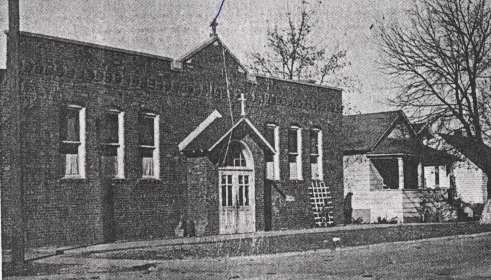 Assumption Catholic School in the mid 1940's.